When Michael and I married and moved in together, he brought with him dozens of crates filled with his substantial comic book collection. It's art, it's literature, he said, when I raised my brow at the sheer amount of books he'd amassed in high school. At one point in our early years, Mike took a big chunk of those comic books and sold them to a comic book store. He came home with a giant wad of cash. This really surprised me! He saved several crates of his favorites to share with our future children. Last year, Michael started reading to the boys from his collection, starting with old X-Men comics, which they loved, and then followed it up with some Spiderman. Nathan loved it so much he started making his own comics. 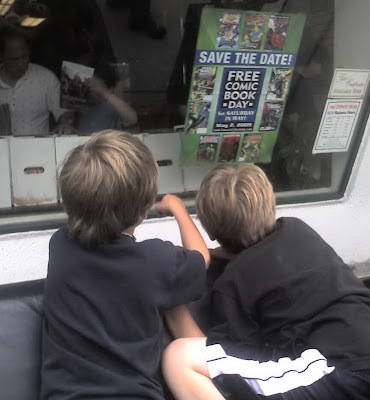 Today Michael took the boys to a special yearly event called Free Comic Book Day. Participating comic book stores give away copies of books to everyone who comes into their store. Mike mapped out four stores in our area and took the boys to all of them, taking advantage of the different titles offered at each one. 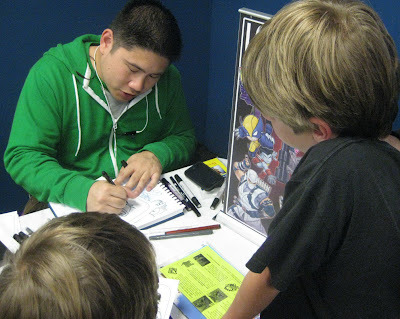 At the first store, The Comic Bug in Manhattan Beach, the boys got some original sketches done by a comic book artist. Nathan told him about his own art and the way he draws characters and then makes them into three dimensional figures that transform into something else. They chatted back and forth about ideas of what he could do with these figures, like creating a line of toys. 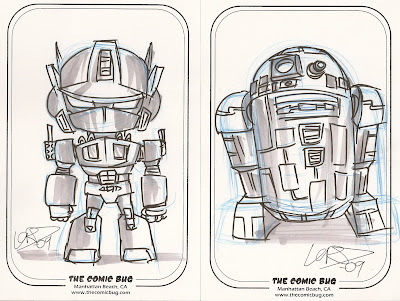 Here are the drawings the boys got (Optimus Prime and R2-D2). There were people in costume at most of the comic book stores. Michael and I went out to see X-Men Origins: Wolverine last night, and there were people in costume there, too. Gotta love L.A.! 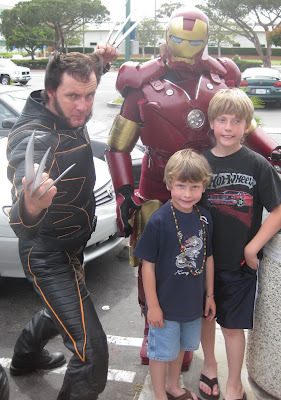 Here's Wolverine and Iron Man along with Benjamin and Nathan. A couple of the stores had some pretty long lines. 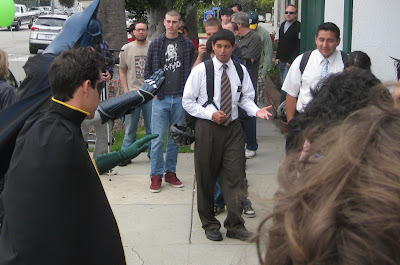 Here you see some Mormon missionaries who may or may not have been trying to convert Batman and Robin, but they did get some free comic books after waiting for an hour! 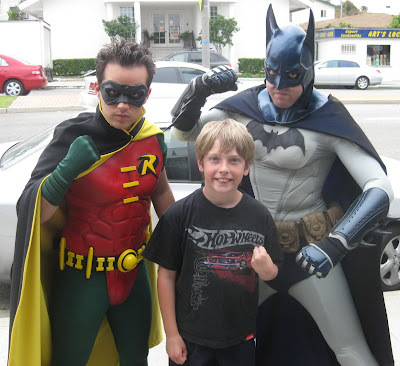 Ben was a little unsure of Batman and Robin, and opted not to jump into this photo. I can't really blame him! And here I thought I'd toss this in. 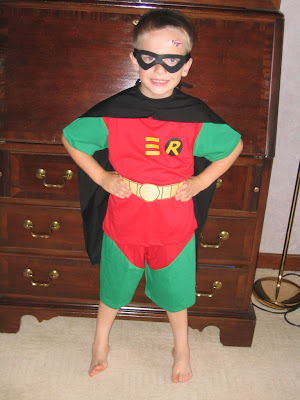 It's Nathan, age 4 1/2, wearing his Robin costume in Hong Kong. Oh, and a Mrs. Incredible Band-aid to cover the stitches on his forehead. All in all, it was a great day for all three of the boys! Nathan rated it "Best Day Ever", and Benjamin was too busy reading his Disney Cars comic book to tell me what he thought!